Before Euan’s Guide, I am also proud to have been involved in the establishment of The Euan MacDonald Centre for MND Research and The Voicebank Study. 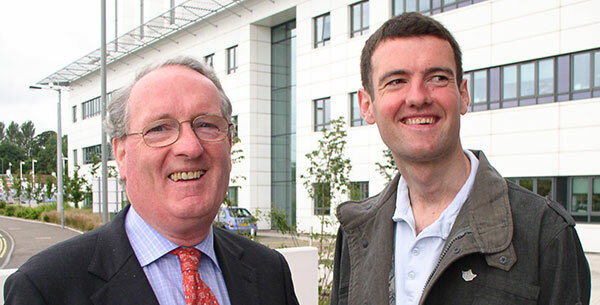 In 2006, my father Donald and I became interested in a diverse group of 12-15 researchers into MND at Edinburgh University. We were keen to stimulate further research into MND and this group formed an excellent base upon which to establish the Centre. It was opened in 2007 and is based next to the Royal Infirmary of Edinburgh and runs alongside the University’s MRC Centre for Regenerative Medicine. The Centre builds on the University’s strong research base into MND but also collaborates with researchers into other related neurological diseases. The research combines with clinicians at the adjacent Royal Infirmary and has a strong emphasis on finding potential treatments. Under the leadership of Professor Chandran, the Centre has attracted people from all over the world with a wide range of expertise including the use of stem cells and collaborates in special projects with other centres in Britain and the USA. The Euan MacDonald Centre is unique in Scotland and relatively unusual in Europe. A number of initiatives have developed from the Centre including a new specialised clinic, the revival of a unique Scotland wide MND register and also the Voicebank Study. With the Informatics Department of Edinburgh University, I helped establish the Voicebank Study to enable people to preserve one of their most personal features - their voice. This study aims to generate a personalised voice for use in a communication aid for individuals who, due to disease, are losing or have lost the ability to speak. This is achieved in one of two ways; firstly, by taking a recording of the voice early on in the disease and storing this for use if required at a later date; secondly, for people unable to record their own voice, we hope to be able to use anonymised “clips” of individual recordings (with permission from the recording donors) to synthesise a computer generated voice that retains accent, age and gender qualities similar to that of the patient. To date over 700 voices have been donated. This project is currently well advanced in the research phase with prototypes currently in development. I feel that an individual’s voice is one of the most personal things that they possess. The Voicebank Study is another project that I feel passionately about.